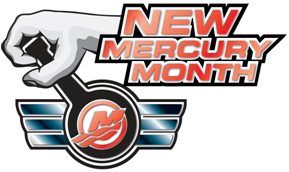 Mercury says October is "New Mercury Month", and throughout the month the company will offer deals and incentives on selected engines and accessories, at participating dealers. The upgrade offer includes selected four-stroke and OptiMax outboard models ranging from 40-225hp. The offer is only available from participating New Mercury Month outboard dealers. For those looking for something bigger, Mercury MerCruiser is offering guaranteed trade-ins from $1,500 up to $6,900** for customers who sign to repower their boat with a new MerCruiser sterndrive or inboard engine. As an added incentive, repowering with a MerCruiser MPI engine will get you a SmartCraft gauge set, either as a two-dial set with SC1000 speedo and tacho, or a five-dial set with SC1000 tacho, trim, volt, temperature and oil link. The MerCruiser offer is available until October 29, 2009 and excludes installation. The offer on outboards is available until October 31. For more information visit www.mercurymarine.com.au or visit your nearest participating New Mercury Month dealer. Conditions apply. *Savings are based on the 2009 recommended retail pricing for 40hp three-cylinder ELPT to 115hp ELPT and 135hp XL to 250hp XL. Offer valid for a limited time and subject to stock availability. **Based on 496HO complete package and balance after trade of $40,232.